Bialy (from Wikipedia): Bialy, a Yiddish word short for bialystoker kuchen, from Bialystok, a city in Poland, is a small roll that is a traditional dish in Polish Ashkenazi cuisine. 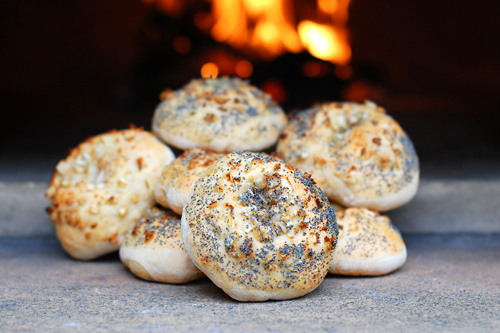 A traditional bialy has a diameter of up to 15 cm (6 inches) and is a chewy yeast roll similar to a bagel. Unlike a bagel, which is boiled before baking, a bialy is simply baked, and instead of a hole in the middle it has a depression. Before baking, this depression is filled with diced onions and other ingredients, including (depending on the recipe) garlic, poppy seeds, or bread crumbs. I first made Bialys a couple of years ago and it seemed I was due to make them again, so I thought that I would do a little experimenting. I pulled the recipe that I had used last and analyzed others that were on the net. Comparing the differences I found that some used fresh minced onions or rehydrated onions or caramelized onions. Some used Malt Syrup and some did not. Some used delayed fermentation and some did not. The percent hydration varied from 55% to 69% as the chart below shows. The hydration categories came from "The Bread Baker's Apprentice". I like the flavor that Malt Syrup adds to Bagels so I went with the malt (I doubled what a number of recipes called for). I did a trial batch to try out fresh or caramelized onions and I did not notice a big difference so I went with the quicker/easier method (fresh). Maybe some other time I will experiment with delayed fermentation but it was easier for me this time to just go with a straight dough. Here I will be experimenting with just the hydration percent. I have read that Bialys are close cousins of Bagels so the first recipe below is probably closer to traditional Bialys. I did want to compare them with a higher hydration version. So, I made two batches, as shown below, but used the same filling for both batches. This is the filling I used per batch. 1. Mix all the ingredients, for a batch, for 3 minutes in a mixer on low speed. 2. Let the dough rest for 5 minutes. 3. Mix for an additional 5 minutes with a mixer or knead by hand (I did it by hand). 4. Allow to rise in a covered bowl for 1 hour. 5. Punch down and degas the dough. 6. Allow to rise for another hour. 7. Scale into 18 units (see weights above). 8. Pre-shape into balls and then tighten the surface tension by pinching to seal the bottom of the dough. 9. Final rise period of 1.5 hours. 10. 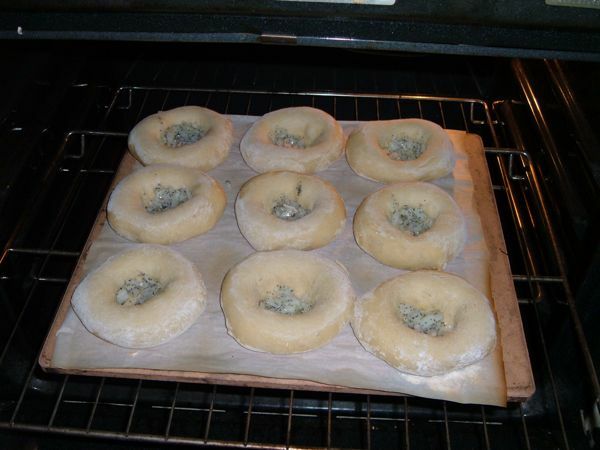 Shape the Bialys into circles with a thin center membrane and place on parchment paper. (Note: I first roll them in a small bowl of flour and then form a depression in the center. You keep working on the depression by stretching it until it kind of looks like a pizza and is 5 to 6 inches in diameter. You are not trying to degas the Bialys as they will be put into the oven right away.) 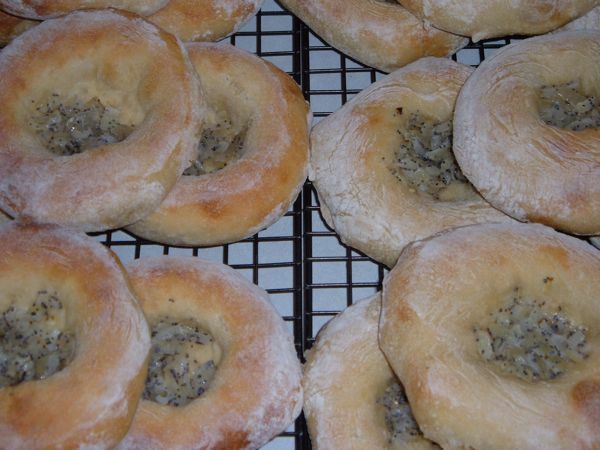 There are some very good videos on YouTube that show you how to shape a Bialy better than I can describe it in words. 11. Add about a teaspoon of filling to the center of each. 1. 45 minutes before you want to bake preheat your oven (with baking stone) to 450°. 2. When ready to bake, slide the Bialys on the parchment paper, then onto the baking stone for 4 minutes. 3. Remove the parchment paper and bake the Bialys on the baking stone for an additional 6 minutes or until they are a dappled golden brown. 4. Remove from the oven and place on a cooling rack. I followed the times pretty closely. The kitchen temperature was 66°. If I did the math right each of these Bialys are about 220 calories and cost less than 10 cents to make. Thanks to RonRay for his tool for calculating the Calories. Note: Took these into work so I had some tasters help evaluate my experiment. The tasters seemed divided pretty equally over which batch they preferred. Bialys ready to go into the oven. Just prior to removing the parchment paper. Batch 1 is on the left and Batch 2 is on the right. A close-up of the previous. All ready to go to work. I was very pleased the way that these came out. Great post. Would you mind if I featured it on the home page for a while? I'm glad that you enjoyed the post. 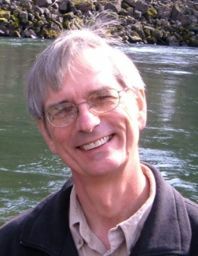 Please feel free to put it on the home page if you like. Hi Dwayne, lovely outcome and very insighful post! Both look fabulous. 1) Which of the two batches would you say is more representative of what you have eaten prior/your baseline for the perfect reference point? 2) Batch one on the left appears slighly browner. Were they baked the same length of time - thus the slightly extra browning being due to the lower hydration level? 1. I think that Batch 1 is more like what I have had in the past. However, most of the people at work who tried both batched did not notice any difference. 2. I tried to bake all the bialys the same length of time. I even baked 9 bialys from batch 1 then 9 from batch 2 just to reduce variables as much as I could, the whole idea of an experiement :) However there may be 30 seconds to 60 seconds difference in the bake time. So maybe the color difference is due to the hydration difference. One more question: did you use any steam in the oven prior or during? I did not use steam in the baking of these Bialys. That would be an interesting experiment to try. I wonder how Bialys are baked commericialy with or without steam. There is a very poignant book about Bialystok, Poland, called The Bialy Eaters, by food writer Mimi Sheraton. It is well worth reading if you enjoy learning about the people and culture behind the bread. I'll try and read it. I've been fighting to keep my dough down, so I appreciate you rounding up all this info, shaping and otherwise. They look toothsome. I'll be trying your recipe this weekend. If you get around to baking please let us know how they turned out, any variations that you made and post pictures if possible. no diff for onions and hydration? thanks for this great post. If i could reach out and grab a bialy from the computer screen, trust me i would have had a couple already. I've wanted to make bialys for a long time now, esp since i made a trip to NY. I even checked out this famed bialys bakery (the name escapes me now, but it's in the lower tenement area, not too far from Russ & Daughters) expecting rows and rows of freshly baked bialys. In fact, i thought i would be able to smell the onions from round the block. sadly i only saw a mostly empty shop - where were the bialys?? ?- and two bored-looking assistants so i did a quick about-turn (maybe i should have investigated more...). Kossar's Bialys is probaly the name that you were trying to recall. Too bad that you were not able to try one there, however many Bagel Shops sell Bialys so you might look around your area. Difference between Caramelised Onions and Fresh Onions: Well I did not notice any big difference but my Wife thought that the Carmelized Onions were better. I got up at 2:00 AM to get things started and did not feel like it was worth the effort. In my baked Bialys, the Onions were nice and tender even though they were baked for 10 minutes. Maybe you can do a couple fresh and the rest Carmelised and let me know what you think. Hydration: I was pretty surprised that most people stopped by and asked what the difference was between the two batches. Like you I would not have expected any (or very minor) taste difference. It was interesting the color difference that Nickisafoodie noticed. Another interesting fact: None of the 20+ people who tried the Bialys I brought in had ever had them before. I was very surprised by that. i'm not in NY, or even in the states, so if i want to eat Bialys i'll have to make it myself:) That said, there are many similar breads with savoury onion fillings around the world. And yupe, Kossars is it! Is it still in operation? Did i catch them at a bad time? It looked big but empty. i noticed the diff in colour but thought it was just due to the oven's hot spot. I will indeed do a test with non-caramelised vs caramelised onions, and will probably use Hamelman's recipe because i liked his bagels. Will post photos when i do but it won't be that soon. Rehydrate and drain 1 Tbl each dried minced onion and dried toasted minced onion. Stir in 1 Tbl each poppy seeds and olive oil. 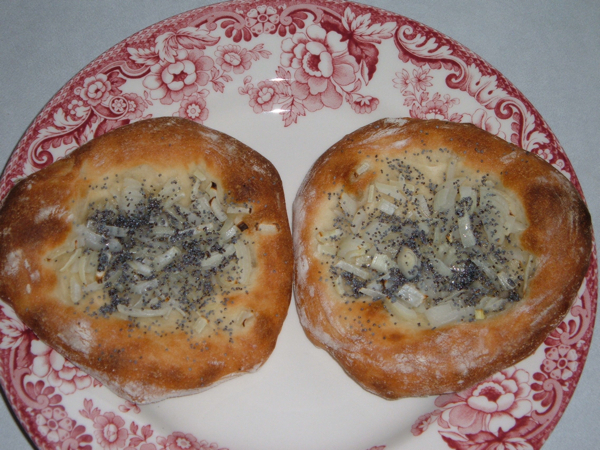 Put one level teaspoon of the filling on each bialy. I just made my first batch yesterday using the recipe on Bread Cetera's web site. Years ago I lived on the Upper West Side of Manhattan long so have been hankering for a good bialy. These were wonderful! I followed the methods, measurements, and times except for the filling and the baking time (which probably has to do with my oven -- mine took 11 minutes rather than 8). 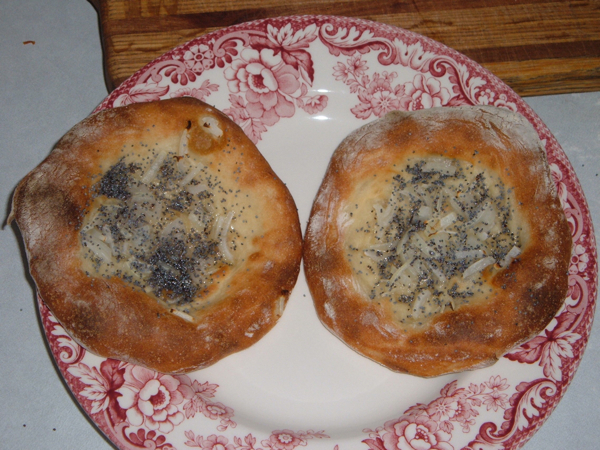 I used the KA short patent flour I got from Stan's NYBakers which resulted in a wonderfully chewy bialy! I got the minced onion and poppy seeds from MySpiceSage. Thank you to this web site for steering me to Stan. I am now a flour-junkie. Dried Onions have a different flavor than fresh. Did you toast these yourself and if so how did you do it? I am waiting for Stan and Norm's book to come out, I hope that it contains a Bialy recipe. I have not played with different flours when making Bialys, I've just used Better For Bread (in the yellow bag, I've forgotten the manufacturer). It is amazing how much variation in bake time can occur between ovens. Yup, I know the flavor would be different but I thought it would be good to try -- and it was. I just put the onions in 1/2 a cup of boiling water for about 30 minutes and drained them before I added the poppy seeds and olive oil. Great post and a lovely recipe. I've made bialys a few times, and one of my guinea pigs in the process was an old guy from Da Bronx who swore the onions had to be sweated in salt for a few hours to be right. Mimi Sheraton also mentions this in her book, The Bialy Eaters. I tried it the last time, and they were great! BTW: these started out looking like yours, but they puffed way up. I think yours are more authentic. Great Looking Bialys Don. I've a few questions for you if you do not mind. 1. How do you apply the Filling/Topping? I only put it in the indentation and from your picture it looks like you also applied it to the tops of the Bialys. Did you brush the tops with anything to make the topping stick? 2. Did you let your Bialys rise after final shaping and applying the filling. That may account for yours being more puffed up. I don't know which would be more authentic. 3. Could you go into more detail on how you make your filling? And yes, I let these sit for 30 minutes before topping, which could easily account for the rise. This brings up an interesting point. In Mimi Sheraton's book, she says that the next generation of bialystoker bakers had to recreate bialys from memory because every one of the hundreds of bakers in Bialystok died in the war. In fact, she says, out of 50,000 jews living in Bialystock, only about 50 survived, and that was because they had moved elsewhere. Sad as that is to think about, it gives us a great deal of lattitude when creating bialys. The size alone, for example, is a topic for debate. One photo in her book that survived the holocaust shows a bialy in a childs' hands that looks more like 8" across than the 6" wikipedia mentions. You can see the post on my site if you like at http://www.woodfiredkitchen.com/?p=1999. Sorry to hear the you had problems with the recipe. I just checked the recipe above to make sure that I had not messed it up but is looks good. The Calculations (20.5/35.3 for ounces and 581/1001 for grams) both yield 58%. A dough that is 58% hydration is pretty firm. What kind of flour did you use? I used Gold Metal - Better for Bread. I hope that your scale is weighing accurately. How did they turn out? Did you shape them before or after you put them in the fridge? An overnight retard should improve the flavor. Any Pictures? I also used a Kitchen Aid stand alone mixer, but I did do some kneading by hand. I guess it is a mystry what happened to your batch. I'm glad that you are game to try it again. I've had problems with parchment paper too but usually when the oven temperature is between 450 and 500 degrees. The paper will start turning color. Sounds like you had good oven spring. I may try egg wash on a few next time. I've started reading the Bialy Eaters which is a very interesting book. I had a request for pizza for Sunday night dinner and so I pulled out Peter Reinhart's "Artisan Breads Every Day" and made his Neo-Neppolitan Pizza Dough. We make personal pizza so I divided the dough into 8 5.4 oz balls. I thought that I would experiment with my pizzas so I divided two of them in half again. I let the dough rest and shaped the 4 small dough balls into bialys. I was trying to make them larger as the book says is the more tradition shape. I added more onions than in the recipe above. Here are how they turned out. The result turned out very well. The color was also more traditional. I baked at 500 degrees for 7 minutes. My Wife only wanted one pizza so went for another experiment. 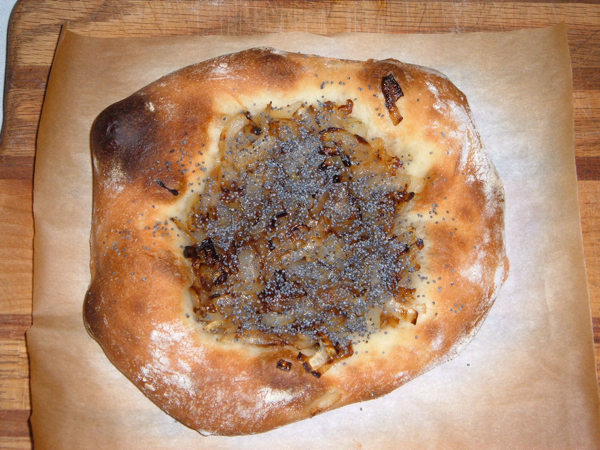 I shaped the 5.4 oz dough and went for carmelized Onions. Hi Dwayne, well I tried the recipe again. Instead of mixing all ingredients in the beginning, I started off with hot water and melted the malt barley syrup and then put yeast and let it bubble, about 15 minutes. I made the dough about 3-4P on saturday and let it rest till 9P, because we had a BBQ and had people over. At 9P shaped them into balls and let it rest till about 1145P and then shaped them into Bialys watching sat night live and then put into fridge overnight and cooked them on sunday morning about 9A. I'll get to the results after this. I used my scale and on line conversion from grams/oz to cups/tablespoon/teaspoon to be exact and made sure I did it right. I found with water to flour ration 58% a very sticky dough. Is that what its supposed to be? 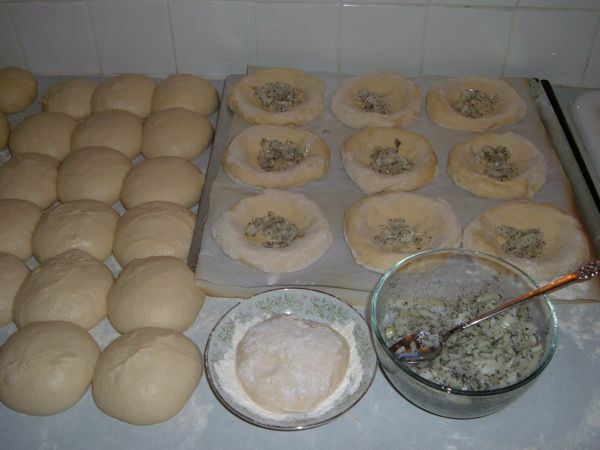 When shaping dough into balls and into bialys I had to keep on using lots flour so it wouldn't stick to my hands. Anybody else had to do this??? This time I didn't use parchment paper. When shaped them into bialys I put cornmeal onto a sheet pan so they wouldn't stick. Something about cornmeal that makes the bread nice & crunchy. Instead of 18, I made 13 at around 3.5 oz each. Drumroll.....the result was phenomenal. They were delicious. Even my family liked them and they're my best critics. They'll tell me right off the bat if they're good or not. I did take a picture, but if someone can tell me how to post a picture, I would appreciate it very much. Dwayne can you please tell me the hydration process works. I don't understand it all. So I'm sticking with this recipe..oh yeah!!! The malt barley syrup is what gives it deep rich flavor. I like using it instead of sugar. I'm glad that everyone likes your Bialys! Parchment paper is easier for me but I will keep the cornmeal in mind. I used RonRay's spreadsheet to do the above calculations. So, when I made the BialysI put my mixing bowl on my scale and dumped in 1001 grams of flour, 20 grams of salt, 7 grams of yeast, 28 grams of Malt Syrup, and 581 grams of water. I then move the mixing bowl to the mixer and started mixing. This dough at 58% hydration should not be sticky. Please let me know if this is the problem. I will try briefly to explain the Hydration process but you would probably find better explanations on the web if you google "Baker's Percentage". Basically it is the weight of each ingredients in relation to the weight of flour. So 20.5 ounces of water divided by 35.3 ounces of water equals 58% hydration. Let me know if this makes sence of not. Hi Dwayne, thanks very much for your reply and the correction. I knew I wasn't losing my mind. The way they came out that I assumed with extra flour here and there came out excellent and tasty. Next time I make them I definitely want to use Whole wheat flour to make them a little bit healthy. I always use whole wheat flour to make pita's, muffins and other baked goodys. In your last sentence I think you meant to say "So 20.5 ounces of water divided by 35.3 ounces of flour (you said water) equals 58% hydration. I think I have an understanding of that. 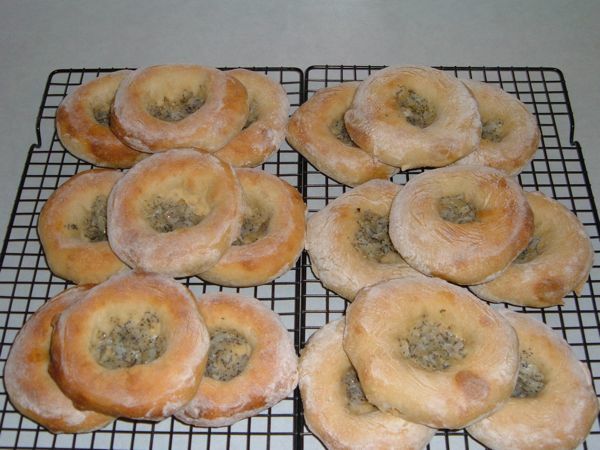 But here is the picture of my Bialys which I'm going to attempt to attach. You are correct that should have said 35.3 ounces of flour. Again I am sorry for the confusion that I caused. Looking over other recipes here on The Fresh Loaf I see that people usually only post using grams or ounces not both. Nice Picture! By the way, where are the Poppy Seeds? Looking over your previous post I see that you fermented your dough much longer than I did and so I'm sure that your Bialys tasted much better than mine. Let us know how Whole Wheat Bialys turn out. thanks for the compliment of the picture. Next time, I'll try using the onion mixture. I just finished reading "The Bialy Eaters" by Mimi Sheraton. A very interesting and sad book about Bialys and the Jewish People from Bialystok Poland. Since no original recipe for Bialys exists here are some thought/hints that I got from the book. The original Bialys only had Flour, Salt, Yeast, and Water. There was no Malt or Sugar in the dough (but I like the malt flavor so I'll continue to use it). High Gluten Flour was used as was fresh Onions. Bread crumbs were added to the filling. They were baked to a darker brown not a golden brown. Dwayne, well I tried and failed to make the bialys healthy. I tried using half bread flour and half whole wheat. My family did not like them at all. I was also over baking them and longer than I should have. I see on your recipe to bake them for 10 minutes. I tried that yesterday with half a recipe and they were much better.I see the bialys from the store, there's not much to them as in taste. They're skinny and crunchy. You might keep reducing the percentage of whole wheat flour (by half) until everyone likes them. Malt Syrup. 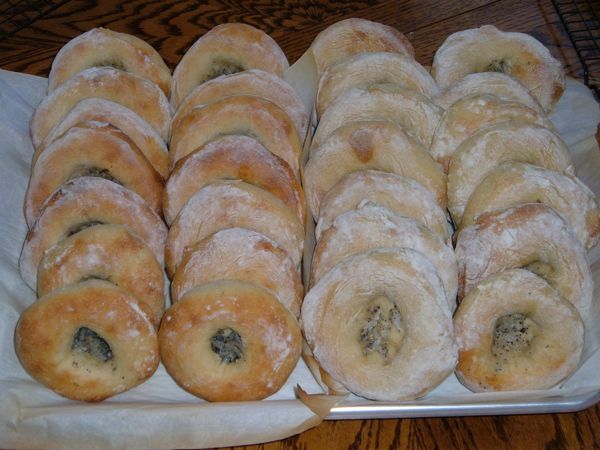 Traditional Bialys had no sweetener at all, just flour, salt, yeast and water. Like I said, I like the flavor of the Malt Syrup as does the rest of my family. I suggest that you do a little experimenting. Make a couple of half batches with different sweeteners and see which gits the most votes. You can try honey, regular granulated sugar, or brown sugar. I do not think that the artificial sweeteners hold up during baking so I would stay away from them. Have you varied the amount of onions that you use? The last experiment of mine I used a lot more and I really like them. Another option I saw was from Dan Lepard's site. He made then with Kalamata Olives and they looked really good. (http://www.danlepard.com/forum/viewtopic.php?f=7&t=2813) I hope that the link works. Best of luck and happy baking!